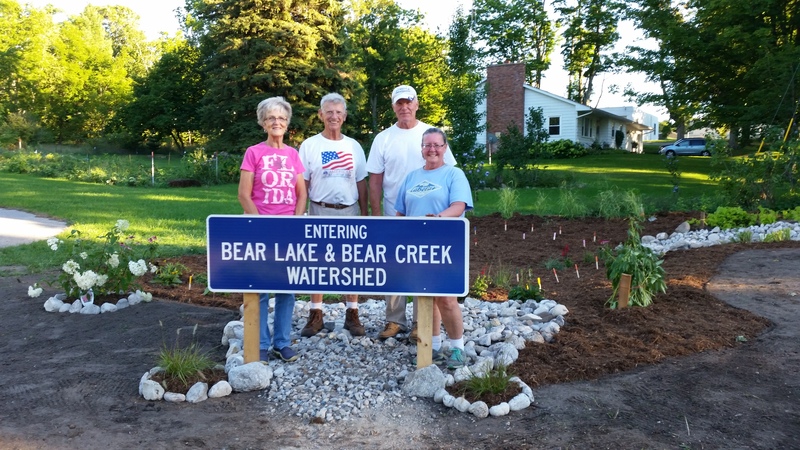 It was a long hot summer but the dedicated group of volunteers from the Bear Lake Watershed Alliance have completed the first round of plantings in their beautiful new rain garden. There were 40 plants placed in the rain garden itself. These plants were selected using strict guidelines for rain garden use in this area. Many volunteers brought in plants from their yards to place around the garden to help make the surrounding area more beautiful. Another 40 or more plants will be planted next spring as weather permits. BLWA is planning on a public dedication ceremony and placing a permanent sign at the garden. The garden is on a small piece of village property located near the Bear Lake library. Rain gardens are becoming very popular around the local lakes in hopes of filtering water runoff prior to it entering the storm drains, which will eventually enter the lake(s). The construction of the rain garden was overseen by Richard Graham. Richard is a retired surveyor and a long time Bear Lake resident. 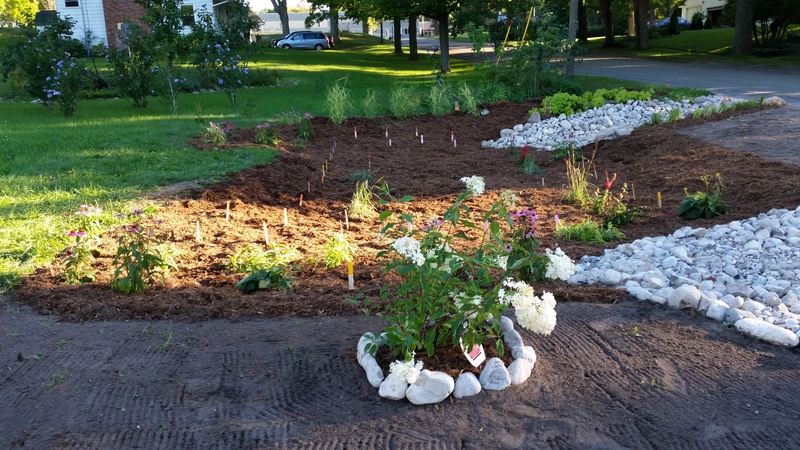 The garden design was created by Sandy Scholl, who will also be in charge of a volunteer maintenance group. Sandy is hoping in the future to get even more volunteers from the community to help enhance the existing gazebo and its surrounding area. To create a garden at this site several large trees needed to be removed followed by extensive excavation. A wonderful group of volunteers helped in every step of the garden to make it a place that will not only filter the water runoff before it enters the storm drains, but made it look beautiful while accomplishing that task. If enough local interest is shown, the BLWA would like to hold a rain garden seminar in the spring. Their hopes are to bring in some of the local leaders that are familiar with rain gardens and have them explain the process of creating a rain garden and why they are so important to the environment we live in. So if you are in Bear Lake, be sure to come by and see our beautiful new rain garden.